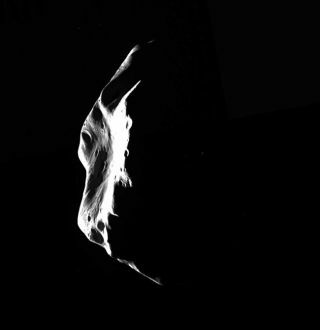 The European Space Agency's Rosetta spacecraft took this image of the asteroid Lutetia during a flyby on July 10, 2010. A European space probe has beamedback a haunting image ofan alien space rock with unique angles and surface coating that raisesmorequestions about asteroids than it answers. The European Space Agency's Rosettaspacecraft recently flewby Lutetia, a huge asteroid midway along Rosetta's path to its ultimatedestination, the comet 67P/Churyumov-Gerasimenko, which it is due to reach in2014. Near-Earth objects are a topic ofgrowing interest toscientists. A two-day NASA workshop in Washington, D.C., this week istacklingtopics such as what to do about spacerocks that could threaten Earth, as well as how to transportastronauts to an asteroid for exploration ? a goal underPresident BarackObama's vision for the space agency. Missions like Rosetta's could helpscientists learn moreabout space rocks and inform these and other goals. At about 100 kilometers (62 miles)wide, Lutetia was thelargest asteroid yet visited by a spacecraft. A closeapproach to Lutetia allowed the probe to snap photos andmeasurements using17 different onboard instruments. The results paint a picture of astrangeasteroid indeed. "I've never seen anything like it,"said ClaudiaAlexander, project scientist for the U.S. Rosetta Project. "It lookedasthough it could have been fractured off of a mother asteroid ? it wasallangles and flat planes, ancient impacts overlaid by newer ones, coveredby dustof some kind." One giant dent in the asteroid's sidewas particularlypuzzling. Alexander guessed that some other space rock had collidedwithLutetia long ago. The surface of Lutetia also had anodd appearance, as ifsome large boulders had rolled over it. "If that is indeed what we're seeing,the questionbecomes: What could have caused the rolling?" Alexander said. "Perhaps the asteroid spun up, spun down or experienced some orbitalirregularity. It's not clear right now that the asteroid is subject totheforces that could cause these things. This is another issue for furtherstudy." Astronomers have been interested inLutetia for yearsbecause it is one of the largestasteroids in the solar system. The light reflecting off of itproduces apattern unlike that of any other asteroid that has been studied. "Right now we have more questionsthan answers,"Alexander said. "We can only speculate at this point about what we'reseeing in the pictures." Scientists expect the data fromRosetta's visit to help themcalculate the asteroid's mass and density, which could reveal moreabout itscreation and composition. One idea posits that Lutetia was bornwhen a planet brokeapart billions of years ago. Or maybe this bit of rock was a leftoverfrom thebeginning of the solar system ? a fragment of planet-buildingmaterial, calleda planetesimal, that never got used to create a larger body. During the coming months astronomerswill analyze the troveof information provided by Rosetta to begin assembling some answers. "When all the data are analyzed,Lutetia will be one ofthe best-known asteroids out there," said Rita Schulz, ESA projectscientist for the Rosetta Mission. "These spectacular images are justthebeginning."